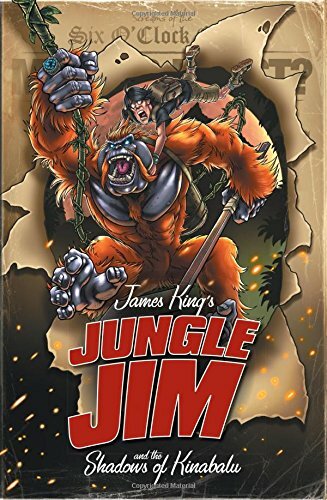 ‘Jungle’ Jim swings into action in his first exciting adventure, as the superpowered simian tries to shed some light on the mysterious Shadows of Kinabalu. In this hilarious modern spin on the timeless werewolf myth, young ice-hockey star, ‘Jungle’ Jim Regent travels to Borneo looking for lost love and adventure, getting more than he bargained for after he is cursed by a tribe of mysterious Iban Headhunters. Now, whenever the moon turns orange, he transforms into an eight-foot-tall, walking, talking orangutan! He’s not a werewolf, he’s a werangutan. He’s not a monster, but an Ancient Protector of Borneo – and the world beyond. The cursed Jim now finds himself living the double life of a superhero as he battles the forces of the Shadow Emperor, an evil overlord who has been dragged into our universe by the reckless Dark Matter experiments of the mad scientist Doctor Gila. These diabolical villains command their army of Dark Matter Shadows from the ruins of a top-secret US government laboratory buried deep beneath the mighty Mount Kinabalu. But Jim is not alone in his battle against the darkness. Fighting alongside him is an oddball group of friends and colleagues: Rufus McFly, a young academic whose expert knowledge of ancient civilisations is invaluable to Jim; Ruthie Moo, a beautiful and resourceful British Secret Agent, and Jim’s childhood sweetheart, Sengalang, the ancient shaman of the Iban Headhunters; Wira, a highly intelligent baby orangutan fully trained in espionage; and a team of specially trained monkeys! This band of unlikely heroes must survive a crazy, colourful, ancient, dangerous world, where nothing is what it seems and where everything, from the other-dimensional bad guys to the creepy crawlies, are out to get you.